A saw blade that has a matrix of diamond chips. Used for cutting ceramics, concrete and masonry. Generally falls into two categories, wet or dry cutting. A diamond saw blade on a walking pavement saw. Diamond blades are HSS (high speed steel) blanks that are tipped with a matrix that contains small chips of industrial diamond. It is not uncommon to see a saw blade like to saw above that has lost one of the segments, but that is nearly always the result of rough treatment. 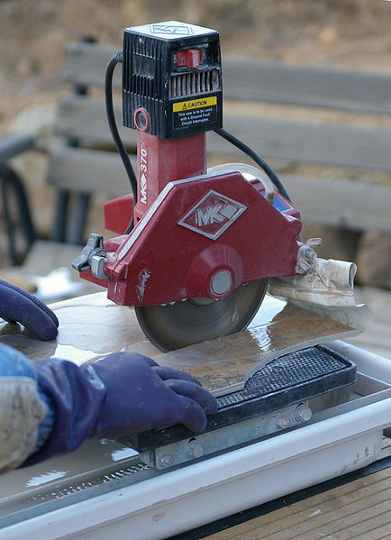 There are two main categories of diamond blades, Wet cutting and dry cutting. Wet blades typically have less provision in the blade for expansion or cooling, because water is the method of cooling the blade down. So, NEVER use a wet blade dry if you want to get the most value out of your money. 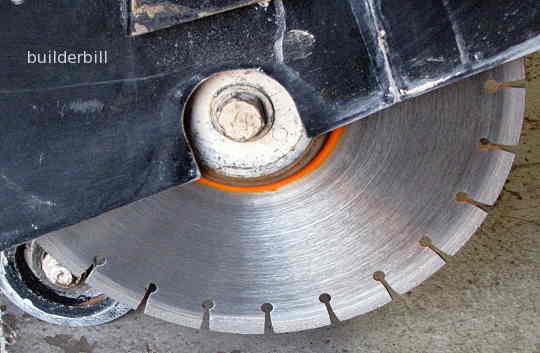 Dry cutting blades typically have a segmented construction with large slots to allow for the inevitable heat build up in the blade cause by sawing material like concrete. Another popular way of cooling the blade is by the so called "turbo" slots around the rim. Dry blades on the other had can be used wet. In fact I recommend it. Only use a blade dry for short and snappy jobs or if it is not convent to do so. Just because it says on the pack, dry cutting, you will keep your blades in better condition and get longer life if the are used wet. 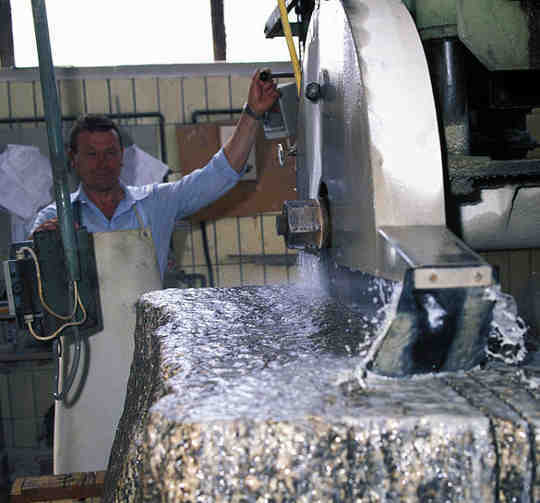 A large wet blade cutting stone. As you can see by the photo above when using saws wet, the amount of work that the saw is doing requires a lot of cooling water. The bigger the saw the more water is needed to keep it cool. 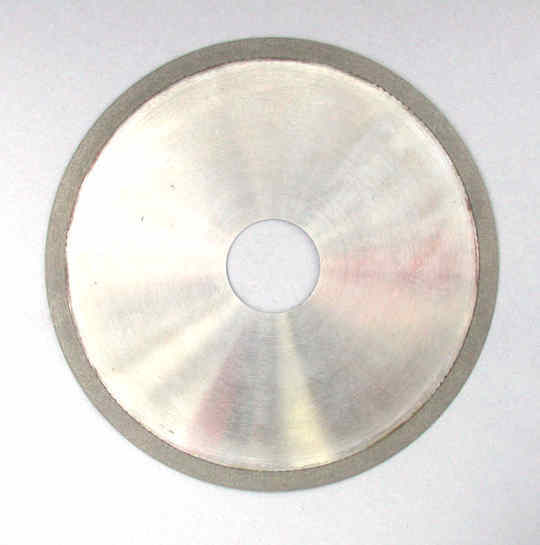 A "Turbo" diamond blade in a small grinder. The large segmental grooves on this blade are there to provide some measure of air cooling when working dry. At the same time the tool should be rested frequently during use. This small grinder should never be used wet. It is not a special purpose sealed machine. 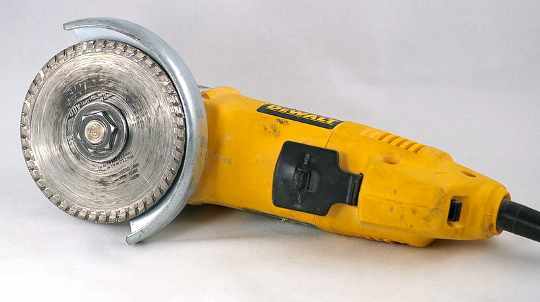 I have used small wet grinders on polished concrete work but this is not one of them. If in any doubt at all don't let water get near to any electric tools. A smooth diamond blade suitable for ceramic tile cutting. Ceramic tiles are a separate category of blade. They are invariably very smooth so that the face of the tile is not chipped when cutting. Wet cutters are a good idea for ceramics but it must be noted that compared to a score cutter they are very messy. I go back to the days of extremely expensive diamond saw blades. At the hire company, with the large diameter blades costing several hundred of dollars they used to measure the blades with a micrometer and charge for the blade usage as well as the hire. Here are a couple of tips that I can give you from the days when I used to run a 24" twin cylinder Wisconsin engined concrete saw. When sawing wet, with a nice flow of water onto the blade you should never see sparks coming off the saw blade. This means that you are pushing it too fast and wasting diamonds. The exception to this of course is when you are sawing through a piece of rebar. Most materials tend to wear the blade normally, the matrix and the diamond chips wear equally so that new diamonds are exposed evenly. Sometimes this doesn't happen and the cutting action fades off. To expose new diamond material cut a few pieces or dress the matrix with a clay brick.